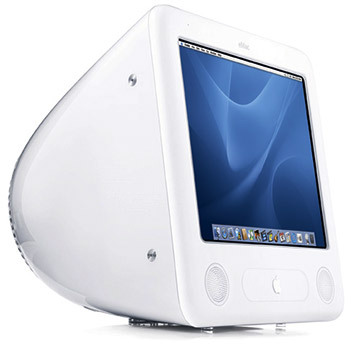 The eMac G4 1.42 (2005) is is powered by a 1.42GHz PowerPC 7447a G4 processor with "Velocity Engine" vector processing, a 512k level 2 cache, 256MB or 512MB of DDR-333 (PC2700) SDRAM installed as paired 128MB or 256MB DIMMs, an 80GB or 160GB Ultra ATA/100 hard drive, a tray-loading "Combo" or dual-layer "SuperDrive" optical drive plus an ATI Radeon 9600 graphics processor running 64MB of VRAM as well as upgrades for AirPort Extreme and Bluetooth possible. Housed in an All in One case with a 1280x960 17.0" CRT display. These models boot into MacOS OSX 10.4 "Tiger" or later with no MacOS 9 support.